At very top end we could see the finest motherboard: X79 Extreme11. This is a premium motherboard using luxury material, applying high-class specification. It's a well-built motherboard and packed to the gills with features. The unprecedented X79 Extreme11 was equipped with LSI SAS2308 chip, providing maximum 10 sets of SATA3 connectors and 8 of the 10 can be used as SAS. Although Intel® has recalled native SAS specification from its X79 Express chipset. ASRock specifically partnered with LSI™ to integrate a LSI SAS2308 chip to make SAS finally appear on its X79 Extreme11 motherboard. PC enthusiasts will also be amazed with the onboard two PLX PEX 8747 bridges. PLX bridge offers solid PCIe 3.0 lanes for PCIe devices and is optimized to support high performance graphics. The two charming bridges make the X79 Extreme11 to be the world's 1st motherboard supporting 4-Way SLI and CrossFireX at PCIe Gen3 x16 / x16 / x16 / x16 mode! Another singing star here is the onboard Creative Sound Core3D quad-core sound and voice processor. It offers rock solid sound experience, supports THX TruStudio PRO™ superior technology, CrystalVoice, EAX 1.0 to EAX 5.0 and Scout Mode™. Featuring the independent processing core, ASRock X79 Extreme11 motherboard allows users to enjoy a pure and solid audio experience. Get ready for a power efficiency, integration and outstanding compatibility motherboard? 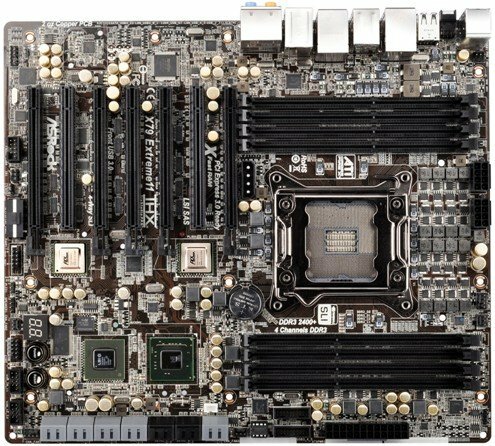 ASRock X79 Extreme11 is a rare, superior motherboard in the market! It brings all luxurious components together, allowing extreme users to bring their computing to the highest level of performance. Z77 Extreme9 is a very powerful, future-proofed, highly overclockable machine and has the most overclockable configurations. It supports the Next Gen Intel® Core Processor and also 4 DIMM DDR3 memory up to 2800+(OC) MHz. Digi Power provides CPU Vcore voltage more efficiently and smoothly. Advanced 8 + 4 power phase design features sturdy components and completely smooth power delivery to the CPU. The most singing specification would be the onboard PLX PEX 8747 bridge. With this, ASRock Z77 Extreme9 is able to run dual VGA cards (2-Way SLI / CrossFireX) at PCIe Gen3 x16 / x16 mode or four VGA cards (4-Way SLI / CrossFireX) at PCIe Gen3 x8 / x8 / x8 / x8 mode. The board even provides a remarkable mini-PCIe slot that is able to work with the bundled WiFi + BT module. Users can take advantage of WiFi 802.11n and Bluetooth v3.0 with ASRock Z77 Extreme9. In addition, ASRock has a pretty good idea which is to bundle a Wi-SB box with this board. Wi-SB box combines the 2 antennas for WiFi + BT and two front USB 3.0 ports. Coupled with WiFi + BT module and ASRock Wi-SB Box, users are assured to enjoy WiFi, BT and USB 3.0 function with this overclocking genius mainboard effortlessly. 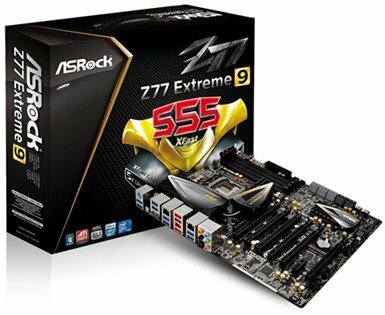 Based on Intel® Z77 chipset, ASRock Z77 Extreme9 still features several state-of-the-art techniques from industry heavy hitters, such as Intel® Smart Connect Technology, Intel® Rapid Start Technology and Lucid Virtu Universal MVP, Broadcom Dual LAN with teaming function, etc. Gaming is so serious. High-performance PC is required to fight with the game. 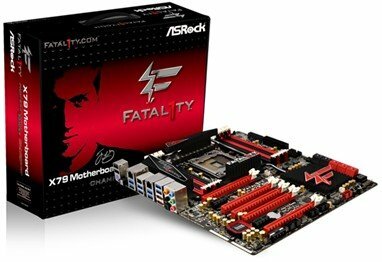 ASRock introduces a top gaming machine "Fatal1ty X79 Champion" at CeBIT 2012 – the world's most powerful gaming kit to date. The enticing features of Fatal1ty X79 Champion include Digi Power, 12 + 2 CPU Power Phase Design supporting Sandy Bridge-E processor, 8 x DDR3 2400+(OC) memory slots, 12 USB 3.0, 6 SATA3 connectors and Broadcom Dual LAN with teaming function. The exclusive Fatal1ty Mouse Port offers precise mouse control, easily helps gamers to beat the opponents. PC enthusiasts will also appreciate rich expansion slots as well. There're 5 x PCIe x16 3.0 slots that are capable of running NVIDIA® 4-Way SLI and AMD 4-Way CrossFireX. For audio aspect, this board is also specially equipped with onboard Creative Sound Core3D quad-core sound and voice processor onboard, offering rock-solid sound entertainment. Luxurious features extend to the onboard voltage measurement points. V-Probe™ is a 7-set of detection points laid on the Fatal1ty X79 Champion, allowing overclockers to easily and quickly get the accurate voltage readings via a multitester. Last but not least, the board comes with Marvel SE9230 controllers that allow users to enjoy the benefits of HyperDuo Plus™ technology. While the SSD and HDD are connected, HyperDuo Plus™ technology can make the SSD become the cache of the HDD to enable SSD-like performance. ASRock HyperDuo Plus technology saves more time on data transmission and provides up to 14 times faster performance than a HDD-only system. 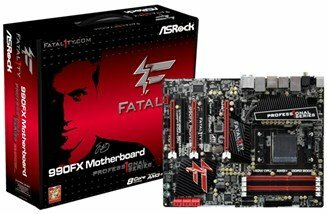 Fatal1ty 990FX Professional is a full featured motherboard with the new AMD 990FX chipset, supporting the AM3+ Socket and 8-Core CPUs. The superb overclocking characteristics include Premium Gold Caps, Digi Power, 12 + 2 power phase design, Fatal1ty Mouse Port and Dual LAN with teaming function. Three graphics card slots support AMD Quad CrossFireX, 3-Way CrossFireX and CrossFireX, as well as NVIDIA® Quad SLI and SLI. This set-up allows the Fatal1ty 990FX Professional motherboard to support virtually any kind of graphic card set-up, providing gamers with the best possible graphics configurations. AMD is best known for cost effective processing and superb over-clocking features, making it a favorite among gamers. 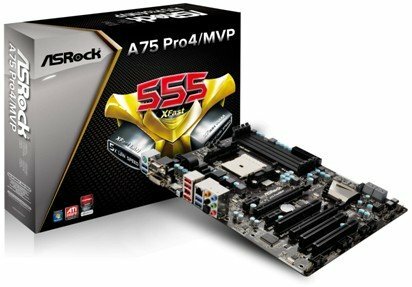 A must-see motherboard at ASRock CeBIT 2012 is A75 Pro4/MVP. This is the first AMD motherboard supporting Lucid Virtu Universal MVP technology in the world. The board allows gamers to take advantage of this new technique and enjoy the amazing HyperFormance™ and Virtual Vsync™ functions. Featuring AMD A75 Hudson-D3 chipset, ASRock A75 Pro4/MVP is wonderfully suited to the AMD Llano APU and can natively support USB 3.0 and SATA3 technologies. Fantastic features of this mobo also include AMD Dual Graphics, Steady Video™, AMD Radeon HD 65XX/64XX and DX11 graphics technology (supported by APU) and ASRock signature On/Off Play technology.